This is the first of a series of technical notes outlining the Shlaer-Mellor and Executable UML notation supported by OOA Tool. This technical note covers Domain Charts which are used to show the domains and bridges used to model a project and realize a system. 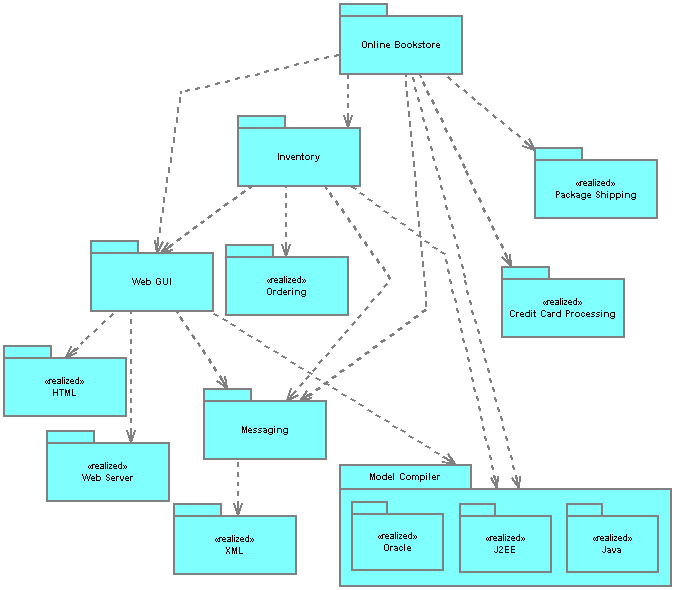 and Executable UML2 (a UML2 [UMLManual05] based variant of xtUML notation). OOA Tool does not support the xUML notation [xUML04] from Kennedy Carter. Domains are represented using ellipse shapes containing the domain name along with subsystem names (prefixed by round bullets) and prominent object names (prefixed by square bullets). The inclusion of subsystem names is new to OOA10 while the inclusion of prominent object names was optional in OOA91. By default, both are shown in OOA Tool. However, if a domain shape's Preferred Size Usage attribute is set to None or Use As Maximum Size then the content shown in the domain shape can be reduced by manually resizing the shape. Prominent object names disappear first, followed by subsystem names later. Bridges are represented using double curved links containing 1 or 2 way points. If you want to reshape a curved link then all you need to do is move the associated way points. However, the locations of these way points are not always obvious since curved links have no kinks! The best way to determine where they are is to select the area containing the link or use CTRL-A to select all shapes and way points and then reselect the specific way point you want to move. 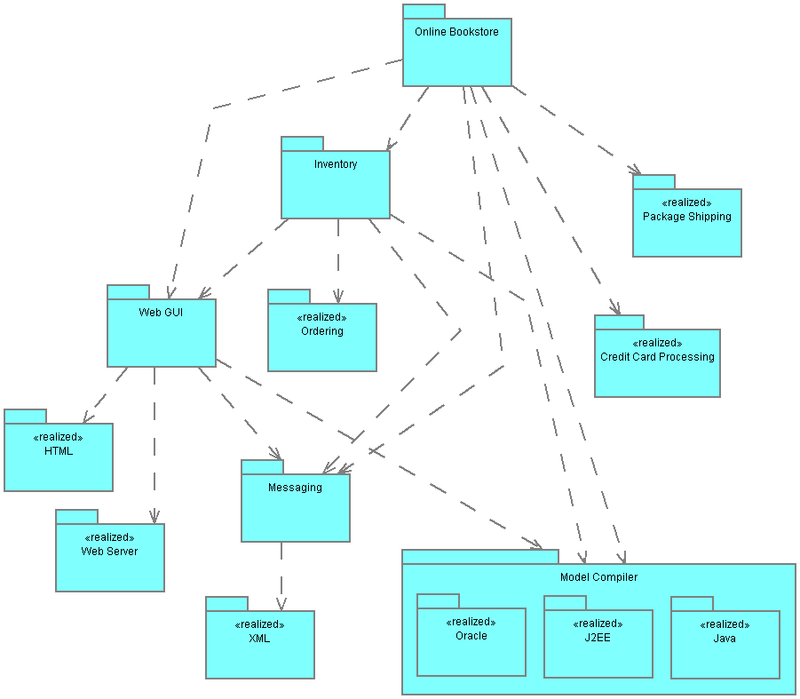 Domains are represented using folder shapes containing the domain name. Subsystems and prominent objects are not currently shown. 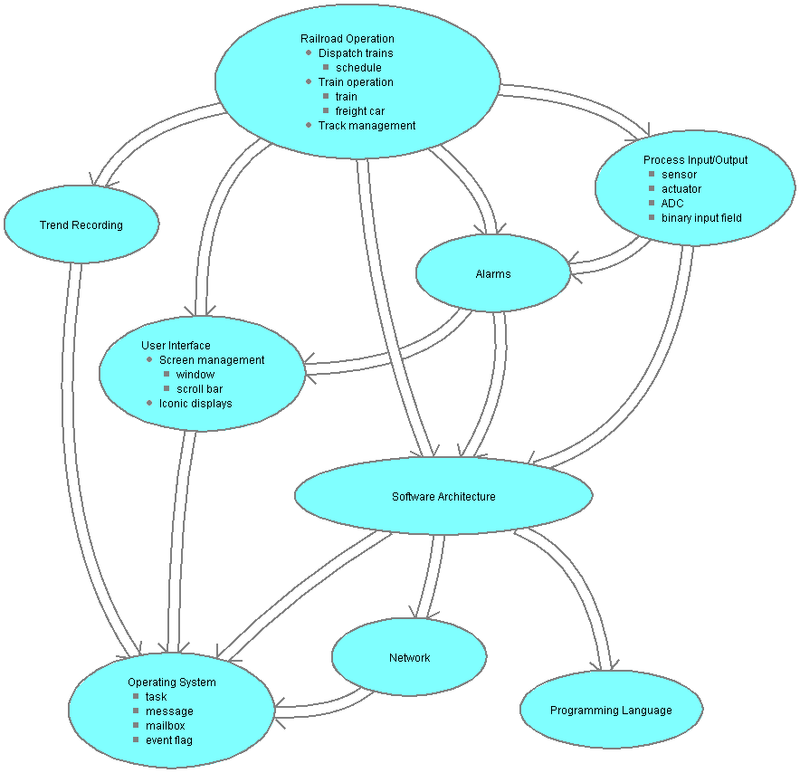 Implementation domains are highlighted using the stereotype «realized». Domain shapes can be resized to include other domains for presentation purposes, e.g. the Model Compiler domain in the example above includes several implementation domains. However, all domains exist at the same level. The Oracle, J2EE and Java domains in the example above can be moved elsewhere in the Domain Chart and you would then see that each has an ordinary bridge from the Model Compiler domain. However, if application or service domains are shown to include a service domain (rather than an implementation domain) then there may be confusion as to whether the included domain is actually a subsystem. Bridges are represented using diagonal links containing 1 or 2 way points. 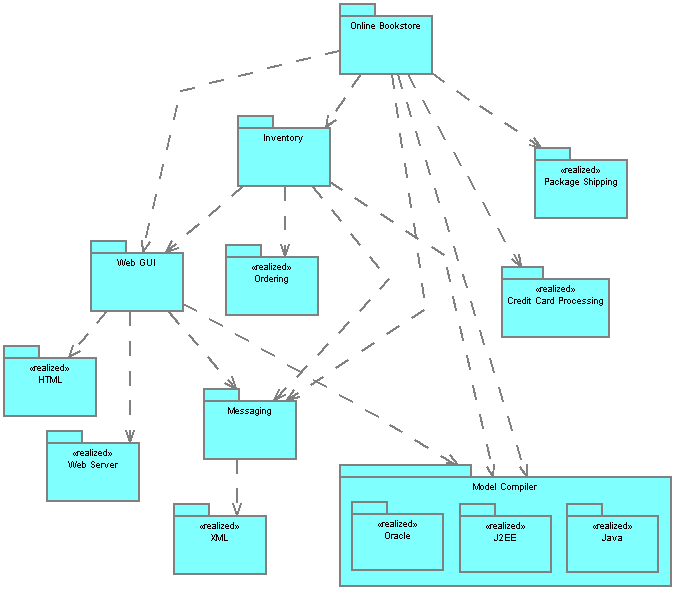 Executable UML uses long (rather than short) dashed links to distinguish Domain Charts from Subsystem Diagrams. Domains are still represented using folder shapes containing the domain name. However, the domain name is now shown in bold and is vertically centred. Furthermore, domains which include other domains now show their domain name in the folder tab if there is enough room. Bridges are still represented using diagonal links containing 1 or 2 way points. However, the links look slightly different. 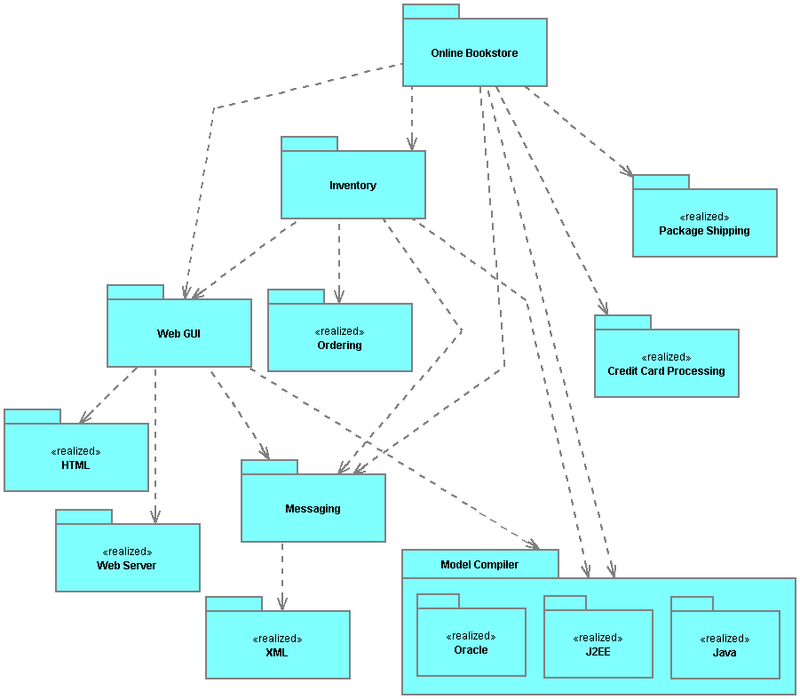 See page 43 of [UMLManual05] for an example UML2 package diagram.